Dragon Quest® IX: Sentinels of the Starry Skies™ for the Nintendo DS family of systems delivers a unique experience that lets players enjoy an adventure that is entirely their own, yet can be shared with others anywhere, anytime. Developed by Square Enix Co., Ltd., this game has already become a phenomenon with players of all ages and backgrounds in Japan, with more than 4.2 million units sold. Before setting off on their adventure, players can create their own heroes, deciding how they would like their face, hair and clothing to look. As the story unfolds, players become stronger, smarter and more powerful, and can customise companions who join their group. Players will have fun discovering more than 1,000 pieces of clothing, armour, weapons and other items that will provide them with a unique appearance and special abilities. Players can also change the class of their character at any time, choosing from a variety of vocations that will impact their abilities and strengths in the game. In Dragon Quest IX: Sentinels of the Starry Skies, players begin their adventure as guardian of a city who is sent to retrieve the fruits of a sacred tree that have the power to grant wishes. Players travel the world, conquer fearsome monsters and unravel an epic storyline. During their journey, players will encounter mighty opponents in fast-paced battles, and also interact with a colourful cast of characters. 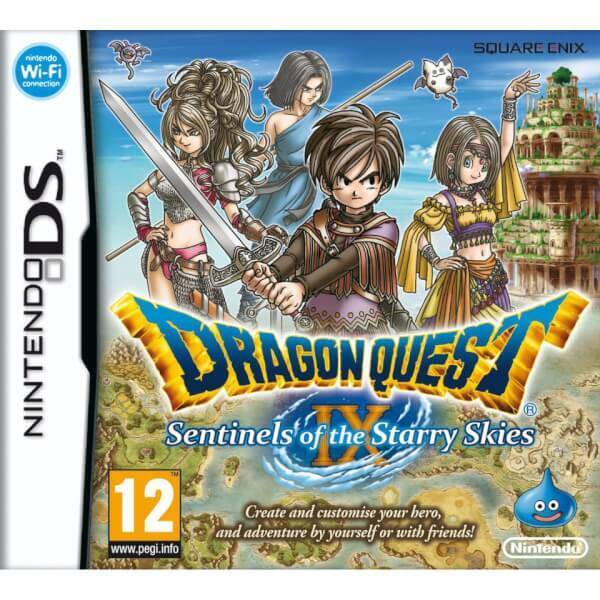 Dragon Quest IX: Sentinels of the Starry Skies contains special modes that let players share their adventure with others, allowing up to four players to team up via a local wireless connection and experience the fun of tackling challenging monsters and dungeons co-operatively with their own unique characters. Players can even leave the game active in their backpacks, pockets or purses and still interact with other players via an interactive "Canvassing Mode." Information about players'; unique characters can be wirelessly transmitted to others, and treasure maps and customised greetings can be exchanged automatically by players who come within range of one another when their games are set to Canvassing Mode. Players looking to enjoy a variety of different game activities can take on special side quests. Some of these quests will be earned by progressing through the game, while additional quests will be made available for free download for players with broadband Internet access after the game launches, providing hours of additional content for virtual adventurers to enjoy either on their own or with friends. Some downloadable quests will continue the main storyline of the game, while others offer standalone missions. One of the biggest games ever to hit Nintendo DS, Dragon Quest IX: Sentinels of the Starry Skies has all the elements of an instant classic: customisation options, a great story, and the ability to share a nearly limitless experience with friends. Get ready to embark on this epic adventure! Create and customise your own hero and companions!